Professor Norman Finkelstein stormed UK campuses in the week to November 11, lecturing to packed auditoriums in London, Leeds, Manchester, Birmingham and Nottingham on How to solve the Israel-Palestine conflict. His main message was that since Israeli settlement, occupation and denial of rights to Palestinian refugees are all acknowledged as illegal under international law, the campaign on these points is as good as won. She had good reason for saying that because under international law “Israel loses, on Jerusalem, on the West Bank and Gaza, on settlements and right of return for refugees,” said Finkelstein. The relevance of this to the campaign for boycott, divestment and sanctions (BDS) was teased out in discussion between Finkelstein and Professor Jonathan Rosenhead, chair of the British Committee for the Universities of Palestine (BRICUP) on Friday afternoon, Nov 11, at UCL. Rosenhead opened with a review of the history of boycott as a weapon available to the weak oppressed by the strong, as in Ireland in the 1880s and in South Africa in 1960s-90s. He said boycotts targeting Israel, begun in 2004, combine “symbolic protest, material intervention and political action.” The overall aim was ending the Israeli system of oppression, as called for by Palestinian civil society. Rosenhead said freedom of expression in academia was a vital principle, but it was not absolute and could conflict with a higher principle, such as freedom and self-determination for an oppressed people. 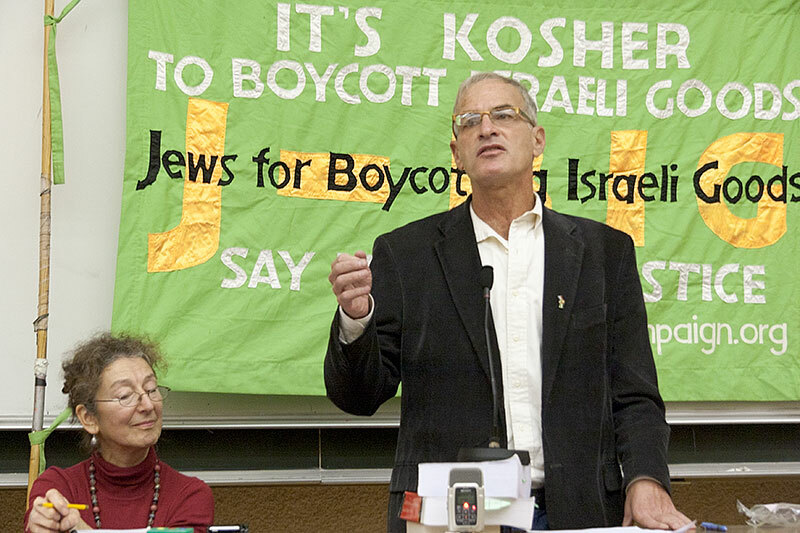 Finkelstein said he supported the BDS campaign as a legitimate and potentially effective tactic. But he locked horns with Rosenhead and many in the audience when he argued that to go beyond goals that were enshrined in international law was to lose the possibility of reaching a broad public. If your target is all Israeli institutions and your goal is an amorphous “system of oppression”, he said, the campaign may be morally pure, but it will be politically useless – a sect. “The public will want to know, you are asking us to boycott until when? Until the Occupation ends, as defined in international law, or until Israel ends? If the latter, you will have no possibility of reaching beyond the people in this room,” Finkelstein said. From the audience, Naomi Foyle of British Writers in Support of Palestine (BWISP) referred to the principles laid down by the Palestinian Campaign for the Academic and Cultural Boycott of Israel (PACBI), setting out the aims of BDS based on international law and human rights and including “dismantling the Israeli system of apartheid”. She argued that Israel fits the United Nations definition of apartheid and that far from this position distancing us from the public, explaining the many ways in which Israel behaves like an apartheid state resonates within huge numbers of people. Abe Hayeem, of Architects and Planners for Justice in Palestine, said the boycott campaign laid considerable stress on the legal arguments when taking its message to the public. “But governments don’t uphold the law, so civil society has to pressure Israel to come to its senses,” Hayeem said. 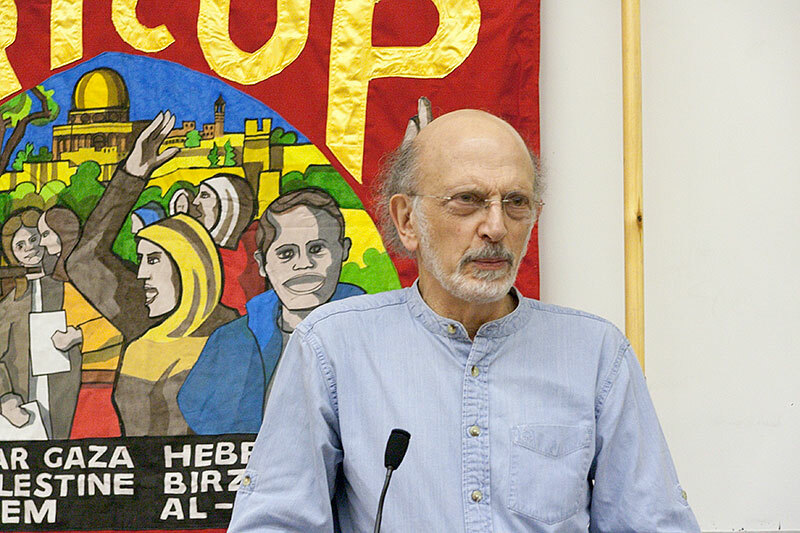 Tony Greenstein, anti-Zionist blogger and founding member of J-BIG, wrote later that Finkelstein’s focus on international law and institutions was misplaced. The full BDS discussion can be heard in an audio recording by Brian Robinson here and on video from InMinds here. The BDS discussion took place as part of Finkelstein’s lecture tour organised by students at University College London, supported by the Palestinian Return Centre and Jews for Boycotting Israeli Goods. The tour was targeted by Zionists attempting to prevent Finkelstein’s trenchant pro-Palestinian message from reaching a wide audience. University authorities in Manchester threatened to cancel his lecture there unless non-students were denied access, forcing the Action Palestine organisers to find an off campus venue at short notice. He denied there had been any pressure on the administration, but Action Palestine said the Jewish Society had alleged that Jewish students could be in danger if an open meeting was held. Finkelstein said such suggestions were absurd. ” I have spoken at Manchester on at least two previous occasions without any incident,” he said. On the day the tour ended, the pro-Zionist weekly Jewish Chronicle filled its front page with a hysterical outburst alleging that Finkelstein was one of “a wave of hate speakers” on UK campuses. But as anyone who attended any of his lectures or has read any of his works will know, his learned, critical and challenging analysis of Middle East history and politics illuminates an area be-fogged with pro-Israel bias. Click here for Brian Robinson’s audio recording of Finkelstein’s lecture at the Logan Hall, Institute of Education, on Friday evening, November 11. See also comment from Tony Greenstein and Naomi Foyle. This entry was posted in academia, BDS, BRICUP, culture, israel, JBIG, Jewish Chronicle, Norman Finkelstein, palestine and tagged academic boycott, Boycott, bricup, Cultural Boycott, Israel, Jewish Chronicle, Jews for Boycotting Israeli Goods, norman finkelstein, Palestine. Bookmark the permalink. Pingback: When BDS became the necessary default position for human rights | Howdy, Bud! Pingback: Hollywood actors to visit Israel on a trip co-sponsored by AIPAC | Beyond The Yew : Saying NO to Globalism!